Born Joshua Treadwell McCown on 4th July 1979, in Jacksonville, Texas USA, he is an American Football player, currently playing for the Cleveland Browns in the quarterback position. Previously, he switched between several teams, including the Arizona Cardinals, Oakland Raiders, Carolina Panthers and Tampa Bay Buccaneers, among others. His career began in 2002. 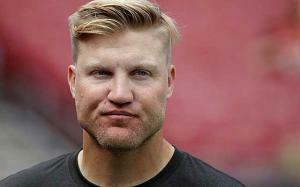 Have you ever wondered how rich Josh McCown is, as of late 2016? According to authoritative sources, it has been estimated that McCown`s net worth is as high as $6 million, earned through his career as a football player. Josh grew up in his hometown, and went to Jacksonville High School, being named East Texas Player of the Year as a senior, while he also earned all-state honorable mention and District 17-4A offensive player of the Year. Years later, he was inducted into the Jacksonville Chamber of Commerce Wall of Fame. After high school, he enrolled at Southern Methodist University, where he continued his playing career, however, he was always a back-up and in his final year he transferred to Sam Houston State, where he dominated the field, with 60.4 percentage completion – 259 successful passes out of 429 attempts. His professional career began in 2002, when he was selected by the Arizona Cardinals as the 81st overall pick in the NFL Draft. He played for the Cardinals until 2005, but until 2004 season he didn`t see much playing time, but when he got his chance, he made 233 successful passes out of 408 attempts, which led to 11 touchdowns, and a passer rating of 74.1. After the 2005 season ended, Josh was released by the Cardinals, but soon found new engagement, signing a contract with the Detroit Lions. Unfortunately, he played two games only in Detroit Lions jersey before he was traded to the Oakland Raiders, which also didn`t last long, as the Raiders didn`t offer him a new contract at the end of the 2007 season, and instead he signed a contract with the Miami Dolphins, but before he put on a jersey he was traded to the Carolina Panthers. Josh just couldn`t catch a break, and his career was declining at an alarming speed, and after only three games in two years at Carolina, Josh tried to revive his career by signing a contract with the Hartford Colonials of the United Football League; he played for them one season, and recorded 114 completed passing, out of 202 attempts, leading to 10 touchdowns. Assuming he was back on track, Josh made a comeback to the NFL, and signed a contract with the San Francisco 49ers in August, but only a month later he was released. Never a quitter, Josh moved once again, when he became a part of the Chicago Bears; he had a somewhat successful season with the Bears, when he played in eight games and threw 13 touchdowns. This led to having 109.0 passer rating, which was third in franchise history, and he was rewarded with the Brian Piccolo Award. However, the Bears didn`t offer him renewal, and he signed a contract worth $10 million over two years with the Tampa Bay Buccaneers; in his first season he started in 11 games, before he suffered an injury. However, in those 11 games he threw for 2,206 yards and 11 touchdowns. The following season he was released, but signed a contract worth $14 million over three years with the Cleveland Browns. Unfortunately, injuries again stopped him from having much playing time, and so far in two seasons with the Browns, he has played in only 13 games, combining for 18 touchdowns. However, his net worth continues to improve, so perhaps his career will follow suit. Regarding his personal life, Josh is married to Natalie, and the couple has four children.